Exit Through The Gift Shop is a great documentary that takes on a topic that seems uncommon in the genre: graffiti. The movie is about graffiti artists, the rising career of one, and one the most famous (or should I say infamous) street artist in the world, Banksy. The documentary starts off with a description of the film’s director Thierry Guetta. Thierry is a Frenchman living in Las Angeles who has a beard described as “coming out from the 19th century.” He constantly films everything around him, from his family to customers at his clothes store and eventually gets involved into the world of graffiti once meeting up with his cousin, who is a big street artist anonymously named “Invader.” He films local street artists in L. A. spraying walls, even meeting up with Shepard Fairey, who did the Obama campaign poster in 2008. Thierry decides to make a documentary about street art and eventually meets up with Banksy. Banksy is known for satirical biting humor in his art. Fans of The Simpsons may recall that he did the opening of the show a few years ago which involved a bunch of Korean kids working in a factory for 20th Century Fox. But Banksy is also very secretive. 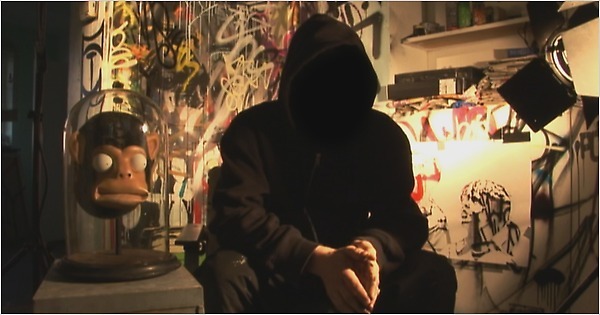 His identity is unknown and the film always keeps him in dark for interviews, blurs out his face, and alters his voice. Banksy wants to help Thierry make his film. Thierry isn’t a very good videographer. He keeps all of his tapes unlabeled in boxes and his first documentary on street art is described by Banksy an enormous mess. So Banksy soon takes over the film and gives insight on how he does his work. The movie’s best moments all come from learning about Banksy. One part shows Banksy and Thierry heading into Disney Land and putting a fake blow up doll of a Guantanamo Bay prisinor outside a ride. Banksy also reveals how he creates his work, showing how he made a stencil of his trademark rat. The movie soon takes the audience to one of Banksy’s art shows, which features much of his artwork. Eventually Thierry, inspired by Banksy and others, decides to become a street artist. This adds much of the speculation of the film: is it a hoax or not? Thierry looks and acts sort of like Inspector Clouseau and is often portrayed in the film as rather bumbling with his French accent. And the street art he does isn’t the work of an amateur, it’s actually really, really good, making many wonder if this was some elaborate plan by Bansky. The questions quickly come up if the entire thing was scripted like I’m Still Here or actually real? It doesn’t matter because the movie is so convincing even though it seems so over the top. I couldn’t help but believe everything that was going on the screen. The documentary is a great success, and sure to please many. The movie is funny and clever while also being very informative about street art. If this didn’t come out against Inside Job back in 2010, there is no doubt in my mind it would have won Best Documentary at the Oscars. Already seen this one twice and it remains entertaining, whether it’s real or not…. It’s so entertaining that it doesn’t really matter. It’s a great documentary. Thanks for commenting. Excellent post, I may check this out now. Thanks! It’s a great movie and it’s very entertaining. Loved this film man. Whether or not it’s real doesn’t matter as the points that it’s trying to make, still stand. It’s a clever commentary on what is perceived to be art. Nice write-up! Yeah, even if it isn’t, it’s really entertaining and a great commentary. Thanks for commenting.